It has been nearly two years since I have covered the long-term technical outlook for Tesla (TSLA). Once again, I decided to take a current look at the long-term technical outlook, and what I found was one of the worst long-term technical setups I have ever seen. In addition, I looked at a number of fundamental stories that also point to further weakness ahead. 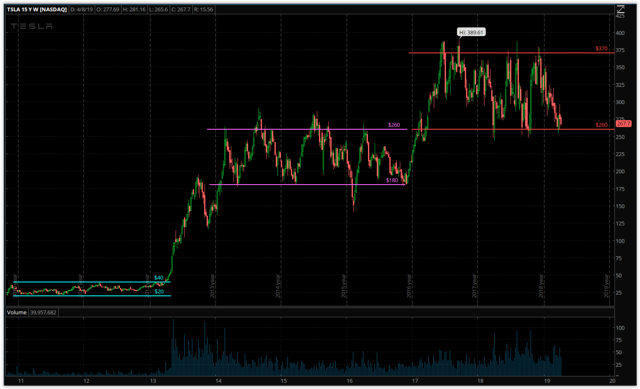 As you can see in the chart below, over the last 10 years, Tesla has traded in three distinct channels. The time that Tesla remains in these channels is usually around 2-3 years. Currently, Tesla has been in its current channel for nearly two and a half years and is trading near the bottom of the range. If the historical pattern holds true, Tesla will find a new range to trade in within the next year. 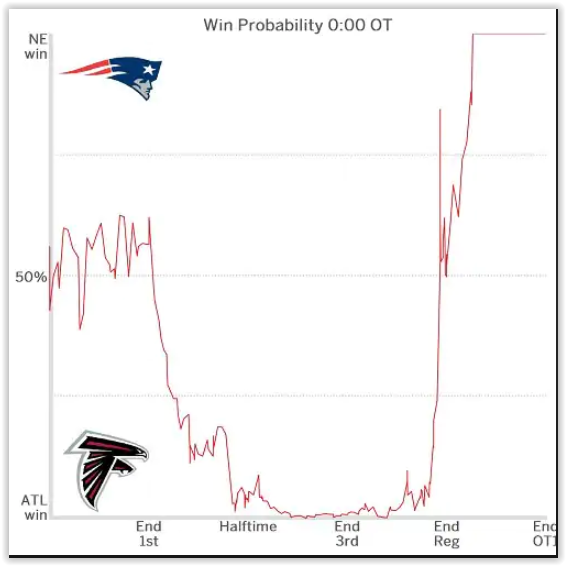 Based on the first chart alone, you cannot determine whether the next leg will be up or down. However, the second chart below does in fact point to where Tesla stock could be heading. In the first paragraph, where I referenced Tesla as having one of the worst technical setups, the chart below is what I was talking about. The purple line shows that the share price of Tesla has been trending higher over the past five years. The problem with this is the new highs Tesla has made are not matched by high levels in the MACD or RSI. 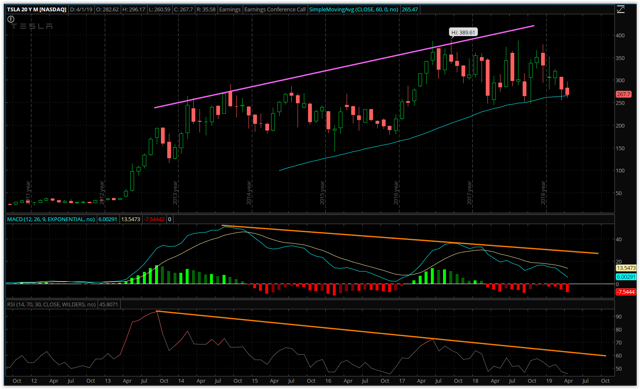 The orange lines show the MACD and RSI have been trending lower over the past five years. With the price trending higher and both the MACD and RSI trending lower, that is a bearish divergence and does not bode well for Tesla. The final item I included on the chart was the blue line, which is the 60-month (5-year moving average), and it shows that Tesla is on the verge of breaking that level. Summing it all up, shares of Tesla are near the bottom of the trading range they have been in for 2+ years, both the MACD and RSI have a bearish divergence pattern, and the 60-month moving average is on the cusp of being broken. Add in all the fundamental reasons I will share below and you have a recipe for Tesla to break out of its current range and move lower. As I showed above, the technical metrics for Tesla are on the verge of breaking down. It is not surprising to me that the technicals are on the verge of breaking down at the same time the fundamental outlook is breaking down as well. On April 3rd, Tesla announced their production and delivery data for Q1 that was well below what analysts had expected. The following quote from the press release shows that deliveries were up substantially year/year but were down 31% sequentially. 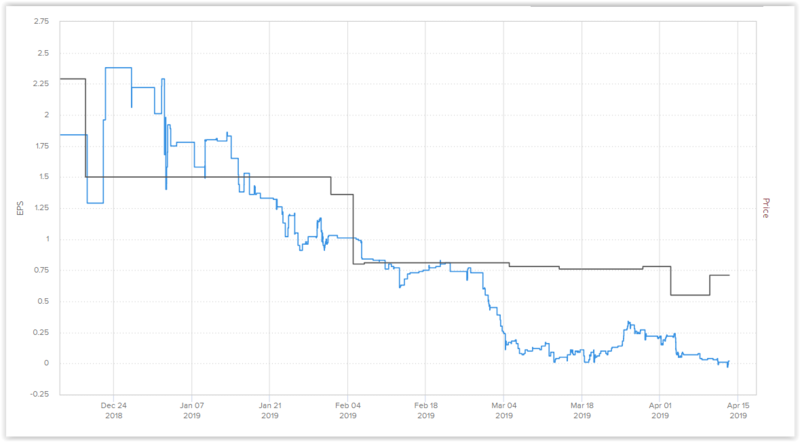 The likely reason for that sharp decline is demand being pulled forward into Q4 because of the expiration of some tax incentives. One of the biggest bull talking points is that there is massive demand for Tesla vehicles. Recent data and news stories suggest that might not be the case. As I noted above, deliveries fell significantly after the tax incentives were cut. 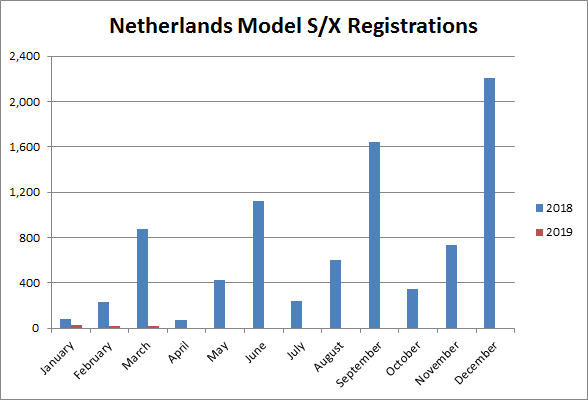 Then, you have this amazing chart (shown below) from fellow author Bill Maurer showing a massive decline in Model S/X registrations in the Netherlands. This is not an inspiring picture of having too much demand, and even worse, the Model S/X provides the best margins, so if there is significantly less demand, what little profits Tesla had are likely to evaporate. The final clue that there might be a demand problem comes from the recent news that Panasonic (OTCPK:PCRFY) and Tesla decided to not expand battery capacity at the Gigafactory. Add on the point that Panasonic decided to suspend some investment in the Shanghai EV plant and the picture seems to be clear that demand for Tesla vehicles is slowing. On February 28th, Elon Musk told CNBC that he does not expect Tesla to be profitable in Q1. Because of Elon Musk telegraphing a lack of profits and the poor delivery data from above, it is easy to see why analysts have been cuttings estimates. Even though the data below shows Tesla could have a positive EPS, that is most likely a non-GAAP estimate, and there will not likely be a GAAP profit for Tesla. After posting a GAAP profit two quarters in a row, many claimed victory, but that victory seems to be short-lived. For example, a fellow author was enthusiastic about the outlook of Tesla after two profitable quarters in a row, that he reiterated his buy rating and had a sky-high price target based on EPS of around $10. This is just one example (of many) where bulls were overly optimistic and confident about Tesla continuing to be profitable. 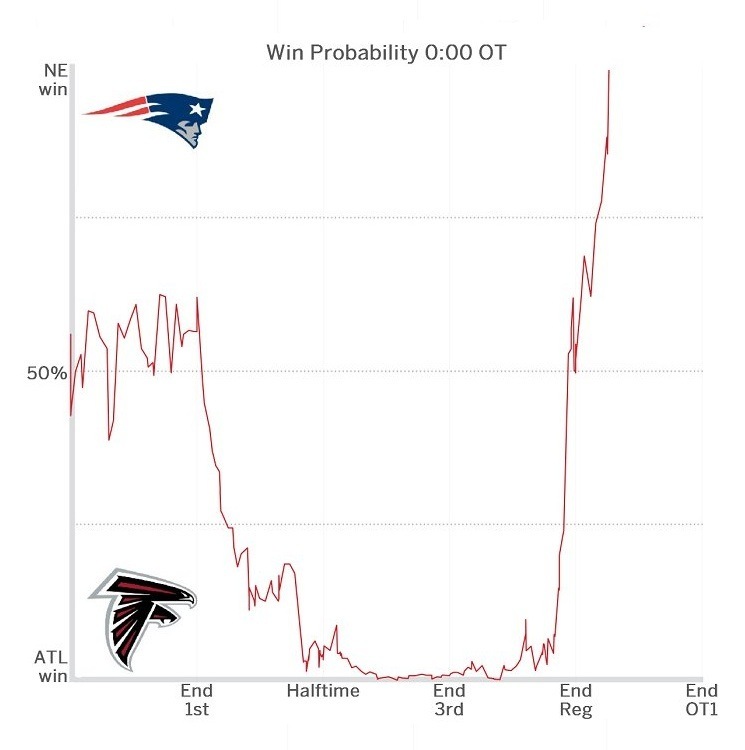 Using a sports metaphor, Tesla bulls are essentially the Atlanta Falcons, who had a good chance to win the Super Bowl, but in the end, things fell apart and New England (shorts) ended up with the victory. One story that in hindsight looks like it did not get enough attention is the fact that T. Rowe Price sold half of their large stake in Tesla during Q4. 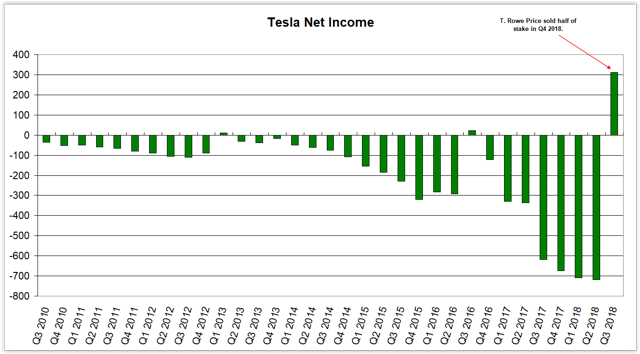 This is intriguing to me, because Tesla released their earnings for Q3 during Q4, and they showed the largest GAAP profit in the last 10 years. During Q4, that is the information that was available, and yet T. Rowe Price still decided to cut its position in half. I looked at net income data from Q3 2010 until Q3 2018 to put into perspective that T. Rowe Price held through an extended period of losses, but the first sign of real profits they decided to cut their position in half. If a firm has held the stock for nearly a decade, through massive losses and then significantly cuts their position at the first sign of real profitability, that is an ominous sign in my book. In closing, the long-term technical outlook for Tesla is rather bleak and on the verge of breaking down. The potential technical breakdown is occurring at the same time Tesla is having increased pressures on their business, which does not bode well for the share price over the long term. I have not played my bearish sentiment on Tesla thus far, but given the confluence of a potential long-term technical breakdown and underlying business pressures, I am considering using options to act on my bearish sentiment. Additional disclosure: I may use options to act on my bearish sentiment sometime in the future. The commentary does not constitute individualized investment advice. The opinions offered herein are not personalized recommendations to buy, sell or hold securities. As I have no knowledge of individual investor circumstances, goals, and/or portfolio concentration or diversification, readers are expected to complete their own due diligence before purchasing any stocks mentioned. The strategies discussed are strictly for illustrative and educational purposes and should not be construed as a recommendation to purchase or sell, or an offer to sell or a solicitation of an offer to buy any security. There is no guarantee that any strategies discussed will be effective. The information provided is not intended to be a complete analysis of every material fact respecting any strategy. The examples presented do not take into consideration commissions, tax implications or other transactions costs, which may significantly affect the economic consequences of a given strategy.